Detail of Fra Angelico, "Arrest of Christ" (c.1450). Fresco, 182 x 181. Museo di San Marco, Cell 33, Florence, Italy. Larger Image of entire fresco. Note Judas with black halo at left. Peter cuts off ear of Malchus on right. "You are my ear, boy," says Caiaphas the High Priest to his servant Malchus. "Now go! Tell me what's happening." His words are sharp. Malchus hasn't been a boy for years, but he is in no position to protest. In fact, Malchus takes pride in being servant to the most powerful Jew in Israel. When he ventures out of the temple into Jerusalem proper, people who know of him treat him with respect. "We're so glad you're here, Malchus," they say. "How may we help you, Malchus?" His special talent is listening, hearing. As reigning high priest in an intensely political environment, Caiaphas has many enemies. Malchus is indeed his ear in the city. Lately, he has been dispatched to learn about Jesus, prophet of Nazareth, who is visiting for Passover. Malchus listens as Jesus teaches in the temple colonnade called Solomon's Porch. "I am the Way, the Truth, and the Life," Jesus is saying. "No one comes to the Father, but by me." What arrogance! thinks the servant. He moves among the crowd incognito, ear open for a seditious comment he can report back to his master. "Come to me, all you who are weak and heavy laden," Jesus continues, "and I will give you rest. Take my yoke upon you and learn from me. For I am gentle and humble in heart, and you will find rest for your souls." Strange, thinks Malchus. How does arrogance fit with gentleness and humility. Malchus sees arrogance and pride up close every day. What is this? "You know that those who are regarded as rulers of the Gentiles lord it over them, and their high officials exercise authority over them," Jesus is saying now. Not only Gentile rulers are like that! reflects Malchus. All rulers want to flex their muscles and make others jump — at least the rulers he's familiar with. "Not so with you," Jesus continues. "Instead, whoever wants to become great among you must be your slave, and whoever wants to be first must be slave of all. For even the Son of Man did not come to be served, but to serve, and to give his life as a ransom for many." Strange words! Amazing words to this slave. So Jesus sees himself as a servant, not a would-be dictator. So different from Caiaphas! "For the Son of Man came to seek and to save what was lost," Jesus concludes. Gradually, he begins to recognize the Teacher's followers. 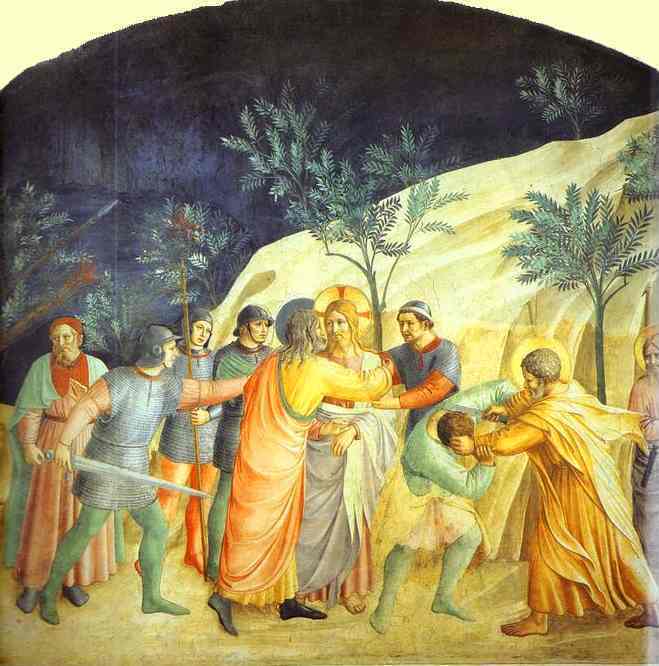 An astute observer of body language, Malchus focuses in on one man, Judas. Ambivalence is written all over him. So Malchus befriends him and arranges for a discreet meeting with Caiaphas. Now it is night, Passover night, and Malchus goes on a hush-hush mission with temple soldiers — and Judas. They move into the Garden of Gethsemane. Suddenly, they encounter someone and soldiers converge, their torches casting eerie dancing shadows among the gnarled olive trees. Malchus, breathing hard, catches up. Jesus is standing, somehow calm amidst the confusion. "Who are you looking for?" he asks. "Jesus of Nazareth," is the retort. "I am he," says Jesus. Now, with supreme hypocrisy, Judas kisses him to confirm the identification and the soldiers move in. One disciple flashes a sword and begins to brandish it wildly. Malchus is struck, blood gushing from his head. The blade has sliced his ear clean off. He clutches at his head to stop the bleeding and drops to one knee. Blood is pouring down his neck, drenching his cloak. He begins to wobble, blackness is engulfing him. Then a sudden warmth. Pain ceases, and the flickering light of the torches reappears. Jesus is kneeling before him, right hand covering his wound. All Malchus can see is the man's eyes filled with a gentleness and love that melt all enmity. "You'll be all right, now," Jesus assures him. A soldier jerks Jesus to his feet and the spell of the moment is broken. Malchus reaches up to feel his head. The ear is there -- all of it. His ear is whole, the bleeding stopped, only his blood-soaked cloak to indicate that there ever was a wound. But the crowd has moved on now, torchlight diminishing, voices receding. Malchus is alone. "You are my ear, boy." Oh, yes! He must run to report what had happened. He must get up and run. Somehow he cannot. The drive to please his master is gone. He cannot forget those gentle eyes boring into his soul. He cannot forget the hand on his face. He hears Jesus' words again, "You'll be all right now." Words of concern — for him, an enemy, deeply involved in the plot to silence the Teacher. He is an agent of Jesus' arch enemy, yet Jesus heals him. It doesn't make sense. Finally, Malchus gets to his feet and returns to the palace. The courtyard is astir with news of Jesus' capture. "The Nazarene is inside being interrogated right now," says one. "The elders have gathered to try him." Malchus returns to his room and removes his stiffening cloak and tunic. He washes the caked blood from his shoulder, arm, and face, and soaks his hair and beard to dissolve the remaining blood. All the time he stares at his ear in the mirror. It is whole, undamaged, without pain. What have I done to this kind, gentle man? Malchus asks himself. The rest of the day is a blur. He follows the multitude to Pilate's quarters, hears the Roman's pathetic attempt at washing his hands of the matter, and goes behind as the crowd surges up the narrow streets to Golgotha, just outside the city. By the time Malchus arrives on the hilltop, Jesus is hanging from a cross, his body and face mutilated almost beyond recognition. Malchus is aghast at what he has done, at his part in this ugly business. Jesus' words flood back, "... To seek and save the lost." Surely, I am lost, says Malchus. I have shed innocent blood. Now Caiaphas arrives, puffing, strutting, taunting. So vengeful, so petty, so filled with hatred. Malchus burns with shame. He kneels, but no one is watching as he pours out his agony and begs forgiveness. Thunder cracks. Wind blows. 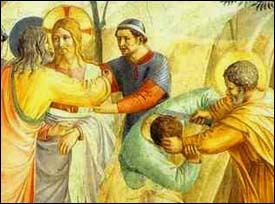 As Malchus strains his ear — his whole ear — he can hear Jesus' unbelievably gracious answer to his cry: "Father, forgive them, for they know not what they do." Malchus rises. The man they call "the ear of Caiaphas" is different, for this slave's ear now listens for a new Master. This fictional story is based on Luke 22:49-51.